Your personal mobile tented safari with own guide,vehicle and cook. A mobile tented with African Bush Safaris is a unique experience. A dedicated guide and chief will look after you 24 hours a day whilst camping in the African bush. You will be met at the airport or hotel by the guide and after ensuring that you have taken care of any last minute shopping, he will drive you in a game viewing vehicle to the first camp. In the camp you will find your tent you will have 2 camping bed or obviously only 1 if you are a single traveller. The tent is high enough to stand in and is quite comfortable for getting dressed etc. Lighting will be provided. There will also be a separate tent close by with a chemical toilet as well as a shower tent. The shower is a bucket shower and hot water will be available for when ever you require it. There will be a basin stand just outside your tent, with hot water when required. The cook will be responsible for preparing the delicious meals, on an open fire. There will be an electrical point where camera’s etc can be charged. Tour dates: Contact us with the dates you have in mind and we will get back to you. Day 1 and 2: We will collect you from your hotel in Maun and we will head off to the Moremi Game Reserve where we will be staying for 2 nights. Your tent has already been set up and the team will be waiting to meet you. Day 3 and 4: Today we transfer to another camp in the Savuti, and we will be driving through the Moremi, Khwai and Chobe reserves, game viewing as we go. Lunch will be on the road en rout to our destination. The Savuti area is well know for it’s large prides of lion, wild dog and elephant. Day 5 and 6: From here we transfer to the Chobe (River front) National Park. The drives along the river and the forests on the ridge are spectacular with the herds coming to drink and the predators that wait to ambush them. Day 7: Unfortunately this is our last morning and after breakfast we take a drive our the game reserve to the Airport in Kasane, where we will leave you in time to catch your flight. Day 3 and 4: We will leave the Moremi game reserve and drive through to Khwai, which is a wilderness area that belongs to the local community, which borders the Moremi and Chobe game reserves (no fences) and is a very game rich area. Day 5 and 6: Today we transfer to another camp in the Savuti, and we will be driving through the Moremi, Khwai and Chobe reserves, game viewing as we go. Lunch will be on the road en rout to our destination. The Savuti area is well know for it’s large prides of lion, wild dog and elephant. Day 7 and 8: From here we transfer to the Chobe (River front) National Park. The drives along the river and the forests on the ridge are spectacular with the herds coming to drink and the predators that wait to ambush them. Day 1 and 2: You will be collected in Maun from your hotel, and we drive through to the Central Kalahari Game reserve where we will be staying for 2 nights. Your tent has already been set up and the team will be waiting to meet you. Day 3 and 4: We head off to through Makgadigadi Game reserve to Nxai pan, taking a ferry ride over the Boteti river en route. Day 5 and 6: We head off through Maun to the Moremi Game reserve. Day 7 and 8: Today we transfer to another camp in the Savuti, and we will be driving through the Moremi, Khwai and Chobe reserves, game viewing as we go. Lunch will be on the road en rout to our destination. The Savuti area is well know for it’s large prides of lion, wild dog and elephant. Day 9 and 10: From here we transfer to the Chobe (River front) National Park. The drives along the river and the forests on the ridge are spectacular with the herds coming to drink and the predators that wait to ambush them. Chobe riverfront – river cruises (game viewing) , open safari vehicle cruises (game viewing), tiger fishing, houseboats and day trips to Victoria Falls. Savuti game reserve -Visit the grasslands of Savuti – a rugged wilderness renowned for its dense herds of plains game and feuding lion prides. Each November, a migration spectacle unfolds as vast herds of zebra move south from the permanent waters of the Linyanti to foal in the Savuti ahead of the summer rains (December to March). The herds thrive here, feasting on tender grass shoots and raising stout foals ahead of the return journey to the Linyanti in autumn. Central Kalahari game reserve- The Central Kalahari game Reserve (CKGR) is the largest, most remotely situated reserve in Southern Africa, and the second largest wildlife reserve in the world, encompassing 52 800 sq kms.During and shortly after good summer rains, the flat grasslands of the reserve’s northern reaches teem with wildlife, which gather at the best grazing areas. These include large herds of springbok and gemsbok, as well as wildebeest, hartebeest, eland and giraffe.At other times of the year, when the animals are more sparsely distributed, the experience of travelling through truly untouched wilderness, of seemingly unending dimensions, is the draw. Kgalagadi- Where the red dunes and scrub fade into infinity and herds of gemsbok, springbok, eland and blue wildebeest follow the seasons, where imposing camel thorn trees provide shade for huge black-mane lions and vantage points for leopard and many raptors… this is the Kgalagadi Transfrontier National Park. An amalgamation of the Kalahari Gemsbok National Park in South Africa (proclaimed in 1931)and the Gemsbok National Park in Botswana, the Kgalagadi Transfrontier Park comprises an area of over 3,6 million hectares – one of very few conservation areas of this magnitude left in the world. Nxai game reserve – The rainy season which is from November to April is the hot wet summer season and the time when Nxai Pan is at its best. Game is abundant from December to April but if the rains have been heavy the roads may be difficult to negotiate. The more accessible times to be in Nxai Pan are in the dry season which is from May to September. Makgadikgadi game reserve – Much of Makgadikgadi Pans National Park comprises nutritious grasslands attracting thousands of animals. It is however, an area of low rainfall and the Boteti River rarely flows to capacity, but often has perennial pools that attract waterbuck, bushbuck and resident hippos. The area was once a superlake almost 100 feet (30 metres) deep, over an area of 30,888 sq. miles (80,000 square km). The climate changed and it 10,000 years ago Lake Makgadikgadi was well on the way to drying up. As the water evaporated, huge glistening salt-encrusted pans were left. These pans look as flat as a billiard table and stretch as far as the eye can see. Occasionally, this extraordinary landscape is dotted with rocky outcrops and large stranded sand dunes.The Makgadikgadi Pans National Park includes a portion of these enormous Makgadikgadi Pans, which are almost devoid of human habitation. However, villages on the periphery and in between the pans is evidence that the area has supported people as far back as the stone age. Today the area contains large numbers of animals who migrate to grasslands in the west of the park after the rains. 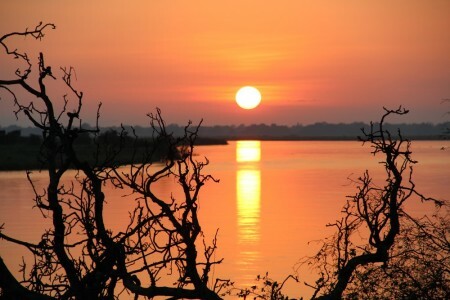 The Okavango and Chobe riverfront is very popular because it is easier to see game in these areas. We have travelled the area extensively so are in a position to offer advice. There are times of the year when you will see more animals in Nxai game reserve than the Central Kalahari Game reserve. The animals follow the water and good grazing. The lodges are of a high standard and operate under trying conditions often resupplied by air as the road transport is over very rough terrain. paradise. Activities: Game drives, night drives, boat cruises and mokoro trips. Cost per person sharing US $3500 for all flights as described and a 6 night stay at the above lodges.